I have been using the printer with the wing covers quite extensively for about 3 weeks, and they work just as intended as far as I can tell. Note that the photo shows a small rectangular hole on the left which is not in the uploaded model. The large rectangular hole is to allow access to the X belt tensioner. 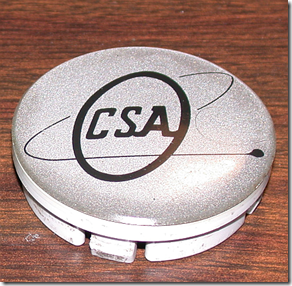 The smaller rectangular hole was not required and therefore removed in the model. 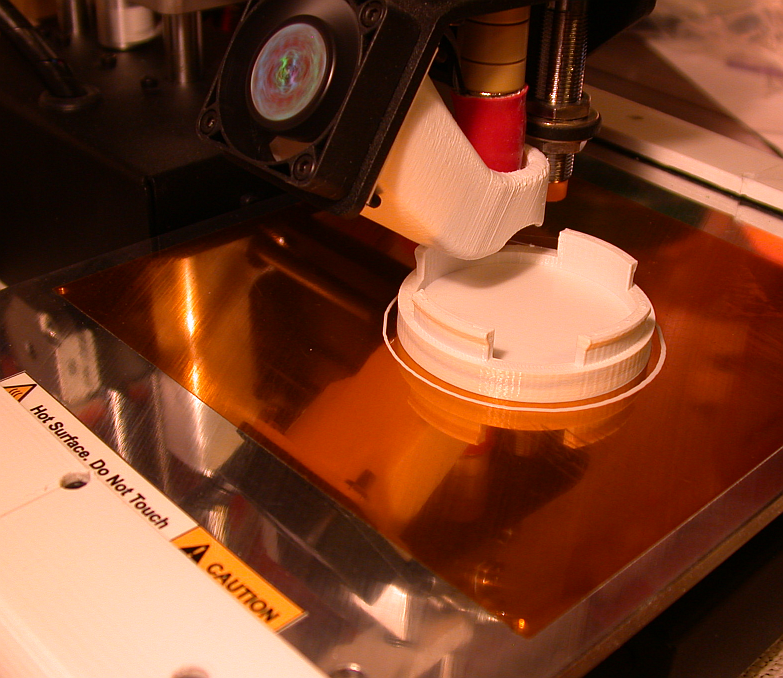 The covers are designed as solid parts, but printed with “hollow” infill and 0.8 mm skin. The parts should be hollow since air is a good heat insulator. With the insulation I can reach 60C bed temperature in 4-5 minutes and 100C in 19-20 minutes. You can for example begin with a simple hello below this post! In the post about printing 3d gears, we saw that it was possible to print replacement gears for car parts. I have now received a report that the printed gear works after several weeks of in-car testing, so let us count that as a success. In fact, it was so successful that I got a request to print another part that was missing; a press-fit wheel centre cap, original as below. The owner also wanted the logo on the replacement part. When you don’t pay, there is no limit to what you can ask for :-) Anyway, I thought we might give it a try. First step was simply to place the original on the flatbed scanner and make an image of the logo. 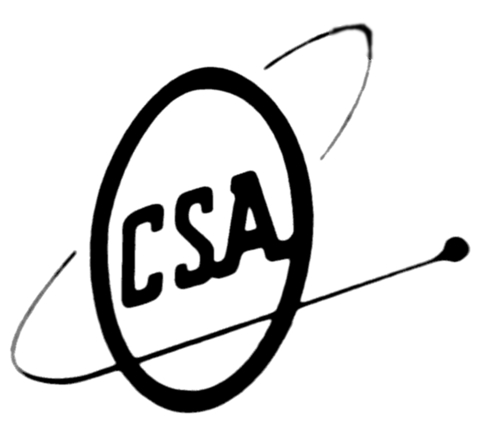 I could have found the logo on the web, but that is cheating. Instead the scanned image was imported into Photoshop and turned into a monochrome image and blurred/clipped and saved to a PNG file. In the above code, the d1 to d4 parameters define measured diameters (using a caliper) on the original. d1 is the outermost diameter. Similarly h1 to h4 define the heights measured from the bottom when logo is pointing down. 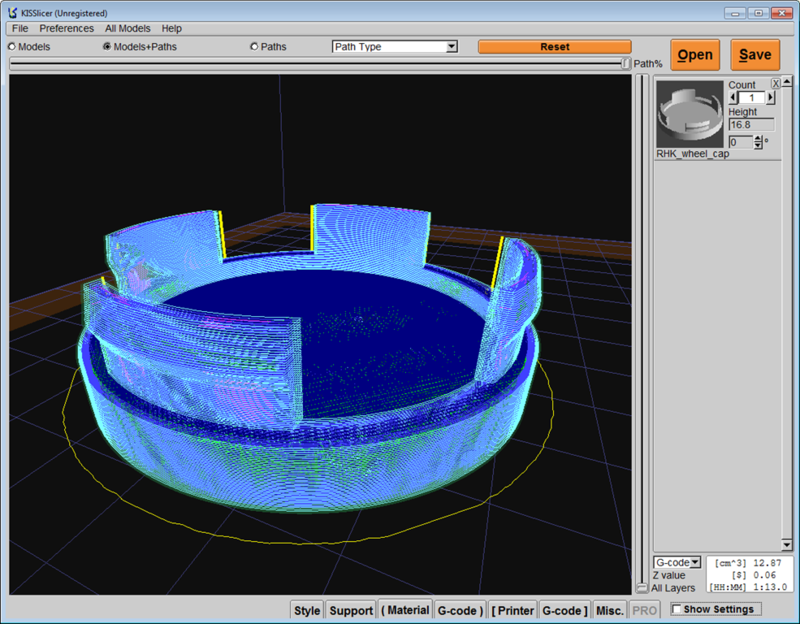 The “logo()” module imports the scanned image and turns it into a 3d object. A slice of that is created by intersecting it with a “cube” (actually a cuboid). The intersection is then scaled, rotated and translated to fit the size and orientation of the printed object. 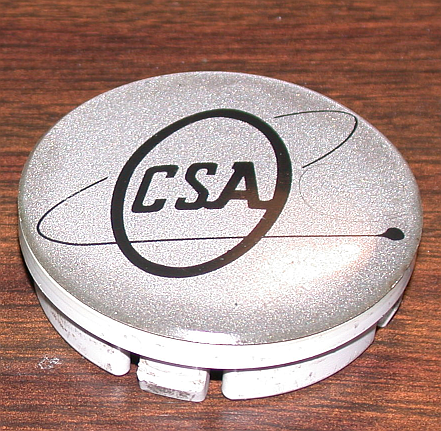 The “bottom()” module is simply a short cylinder minus the logo at bottom and a smaller cylinder on top, to create a “rim” on the bottom part. The “teeth()” module describes the 2d profile of the teeth that grips the wheel and then performs a rotational extrude (360 degrees). 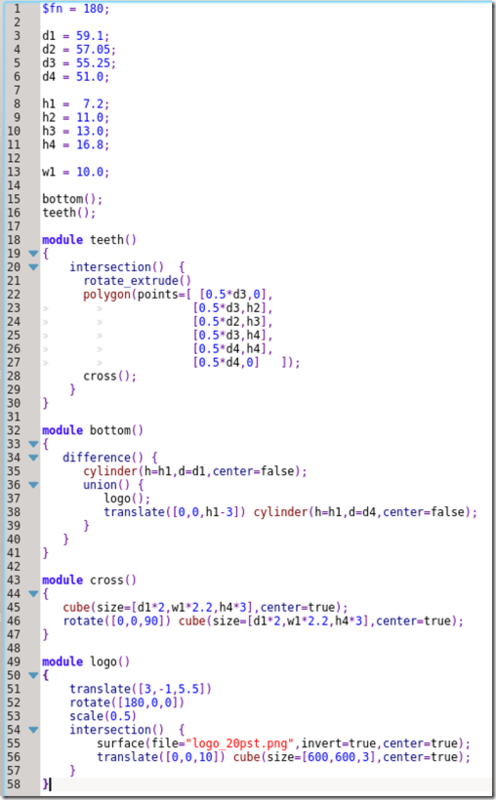 This is then intersected with the result of the “cross()” module which simply defines a cross from 2 cuboids. The result is 4 teeth, separated by 90 degrees. 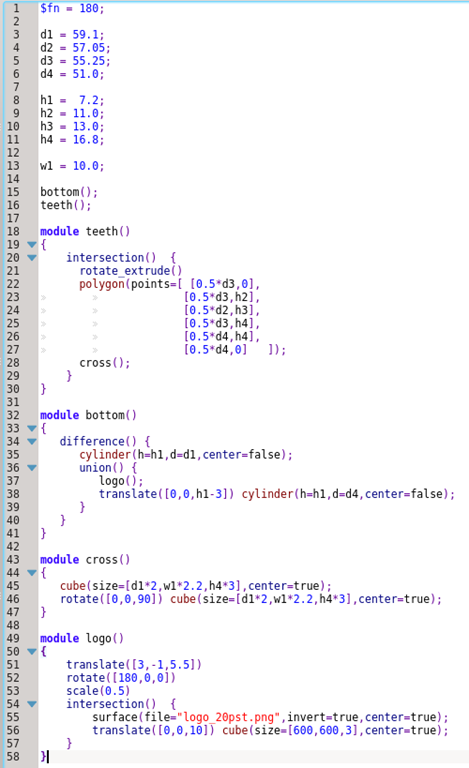 All in all, less than 60 lines of code. 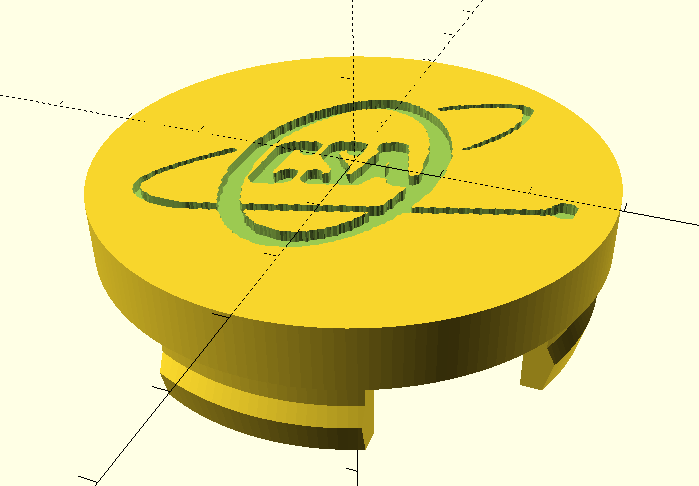 We then get this OpenSCAD model to export as an STL file. There are many ways to process an STL file, but generally it needs to be run through a “slicer” program to generate the G-code that a printer can understand. 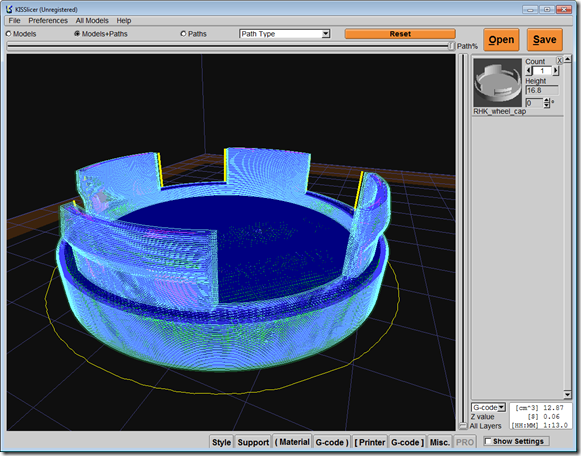 There are many very good slicer programs, including slic3r and Cura, but recently I have been using KISSlicer, as it has many nice customization options. 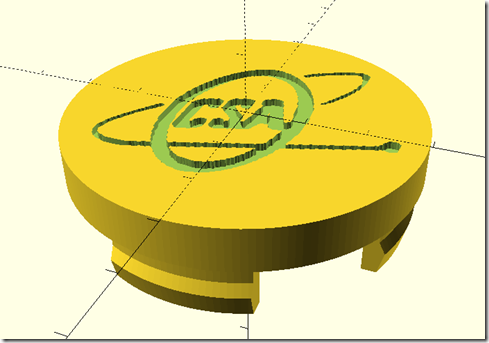 When finished, we have something that closely resembles the OpenSCAD model. 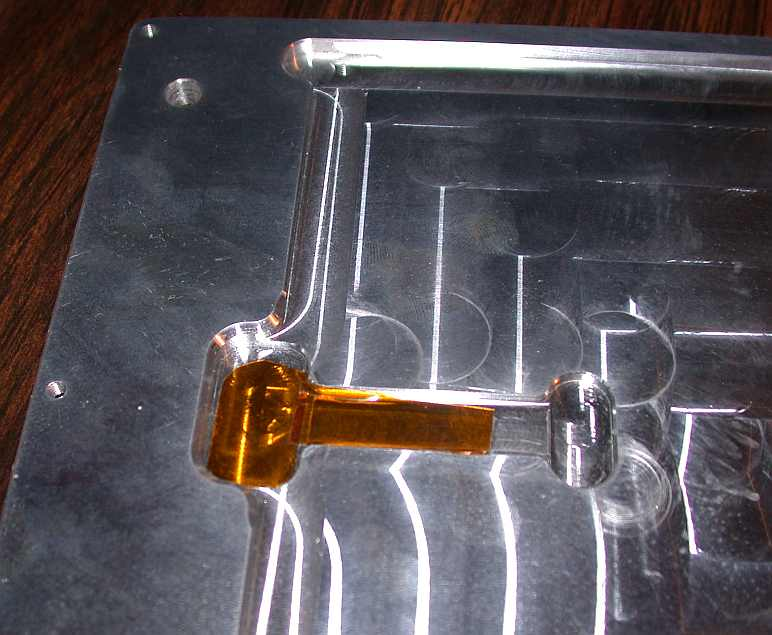 A challenge with a part like this is that the printed part is relatively brittle compared to the original, so it is hoped that the teeth simply do not break off. This is why the printed teeth are made wider than in the original, where it is only the smaller teeth that grip the wheel. The break in posts on 3d printing does not indicate that nothing has happened in the time passed. On the contrary, I have been too busy exploring various smaller problems and ways to improve. The most important improvement is the installation of the “heated bed” upgrade that has been waiting since I got the printer. I left it alone for a while because I wanted to get some experience with printing on the unheated standard bed. I think now it was a good idea, because I can see the benefits in better perspective after installing the upgrade. 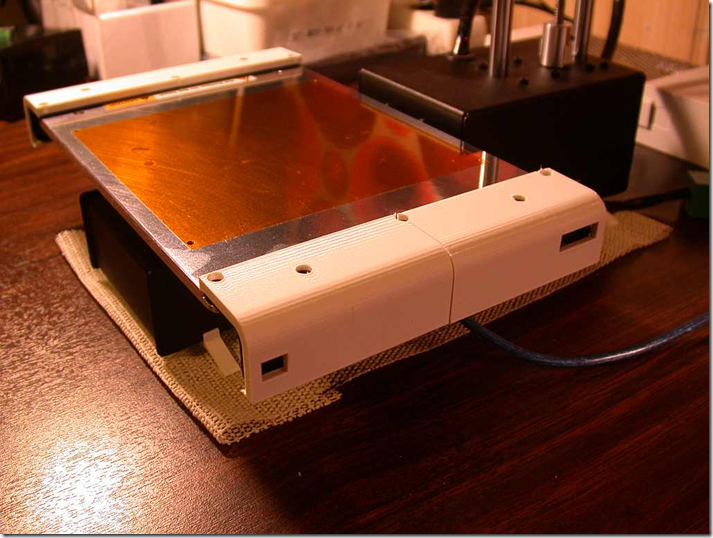 So what exactly is the “heated bed”? It means that the print surface is heated by a heating element so that the plastic parts do not warp as easily (or at all). 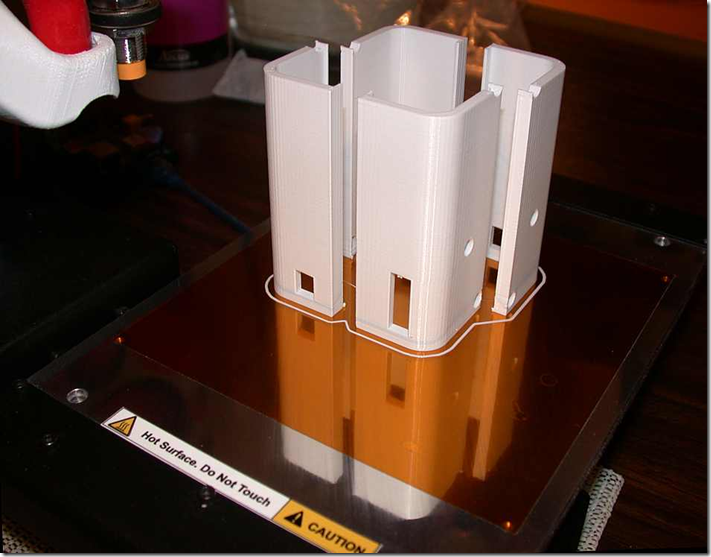 With the unheated bed there will be temperature gradients in the parts causing warping, especially when the print surface is relatively large, i.e. longer than just a couple of centimetres. 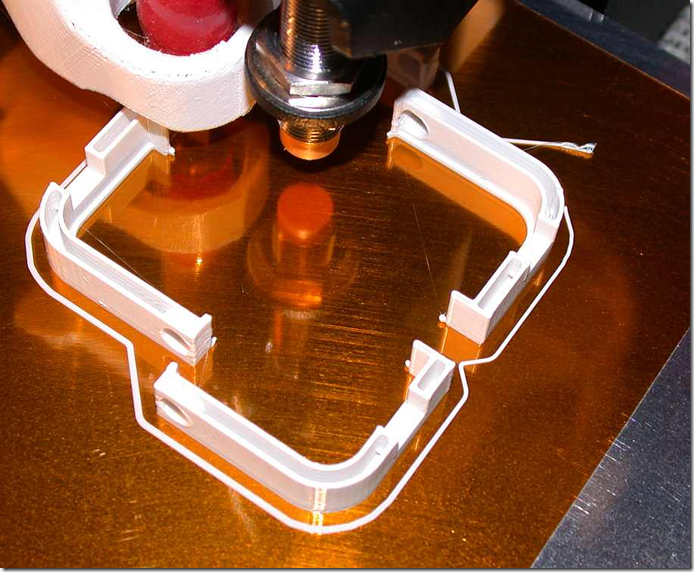 With the heated bed the temperature is more uniform through the part and you can then create more geometrically accurate parts. Since I am mostly interested in mechanical parts, it is important. 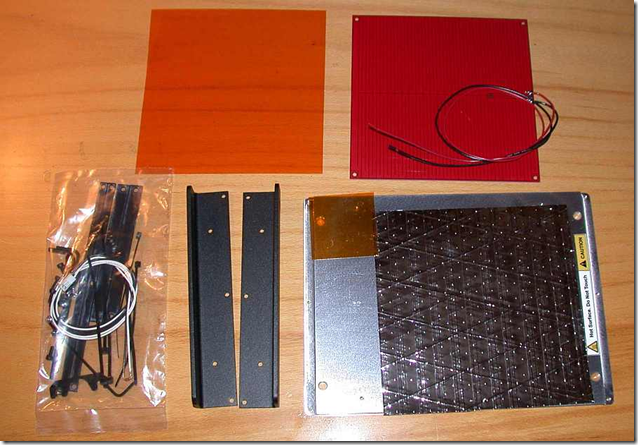 The upgrade kit contained a machined aluminium print surface (bottom right). 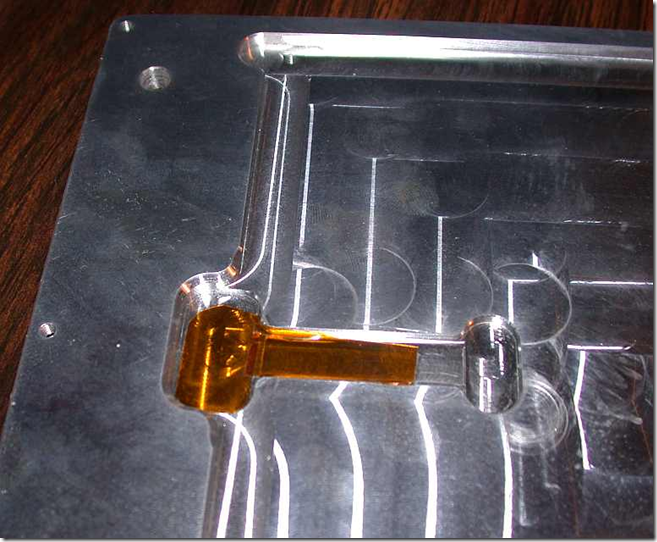 Being machined, it also provides a flatter surface than the standard bed, which can be slightly non-flat. The other main parts are the 2 black aluminium “wings” that are needed for the X belt after removing the standard non-heated bed. 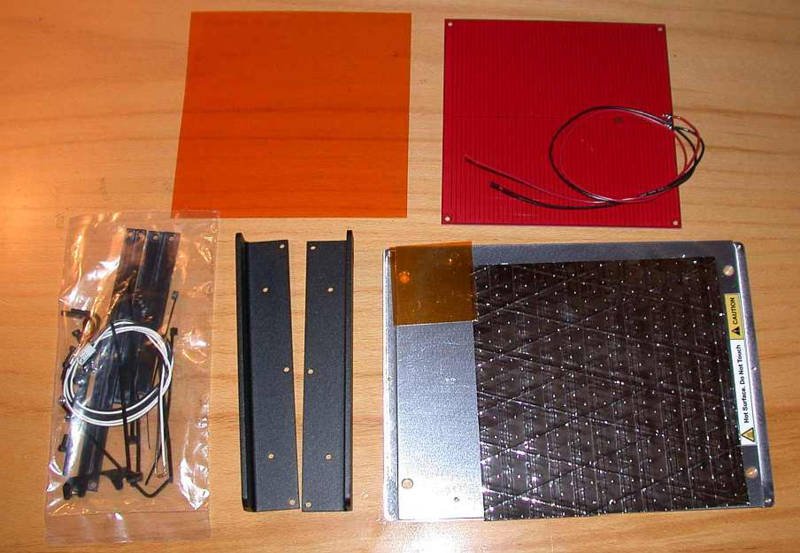 At top left is the heater element with 12V wires and next to it is a sheet of heat resistant Kapton tape which will be fastened to the aluminium print surface. In the bag is a thermistor that will be used for monitoring and controlling the bed temperature. Both the thermistor and the heat element power wires connects to the board under the printer. The bag also contains delrin parts to help insulate the “wings” from the hot print surface. On the underside of the machined print surface, there are grooves that must be electrically insulated using Kapton tape. The biggest groove will contain the soldering points on the heater element and the smaller groove is for the thermistor. 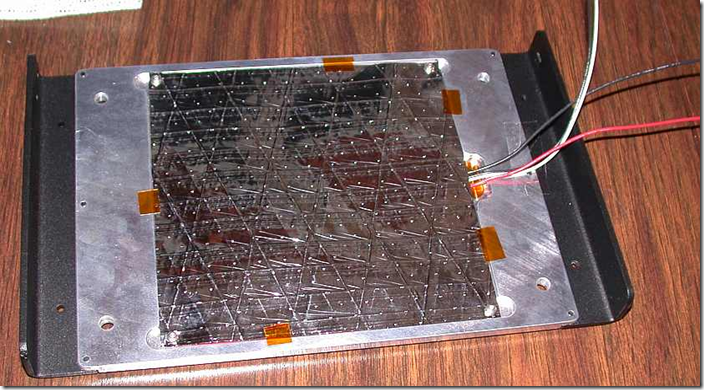 After placing the thermistor in its place, the heater element is put on top (i.e. under it, since the print surface is upside down still). The black & white wires are for the thermistor. Over (i.e. 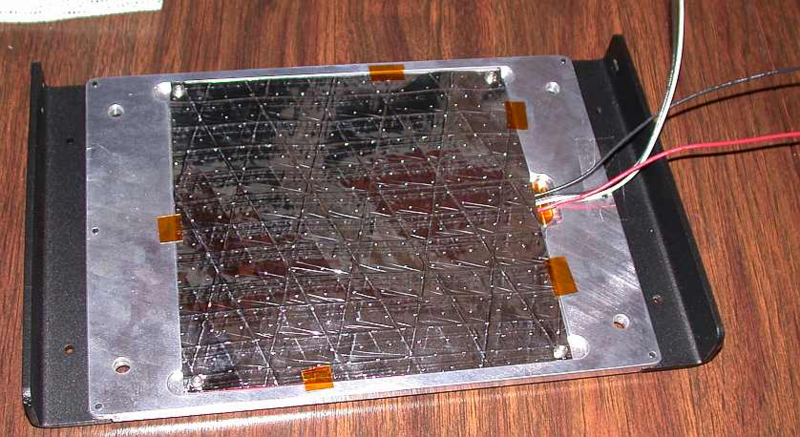 under) the heater plate comes a reflective sheet that is simply screwed into the corners. I added some Kapton tape pieces to secure it. I am not sure this is sheet very effective, heat is lost not only via radiation. It would make sense to let the sheet cover the whole plate also. But this is according to the kit. What remains after this is to turn the heated bed around and connect the X-belt to the wings and then connect the wires to the board. But I also added an update of my own. Under the 4 corners of the heated bed I put a flat and a split washer so that it is possible to manually adjust the “bed level”, i.e. 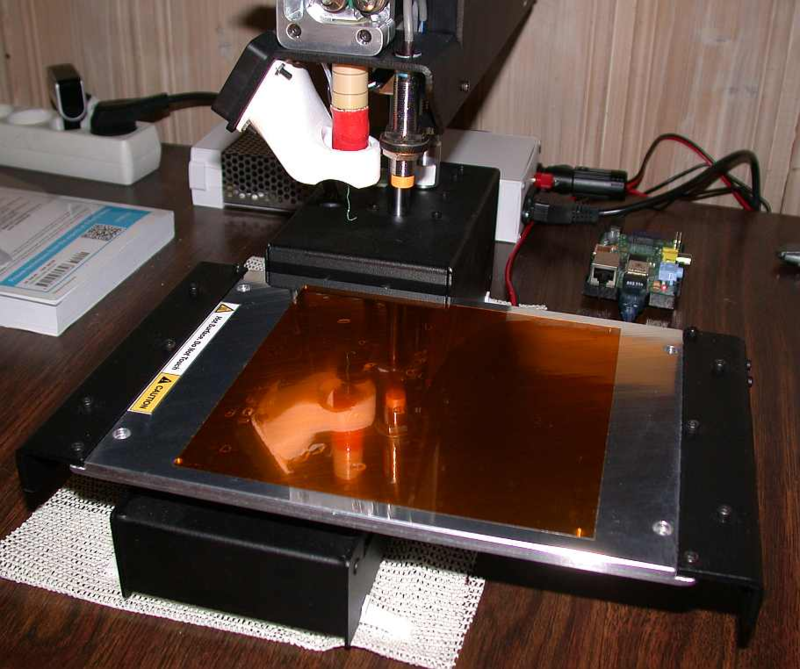 manually make the print surface as perpendicular as possible to the print Z-axis of the printer. The goal is not to replace the Z probe which accounts for unlevelled beds automatically, but to ensure the adjustments are very small. Once installed, we have a new and shiny printer! Notice also the Raspberry Pi Model B in the background, that is the other important upgrades that the recent weeks have seen. 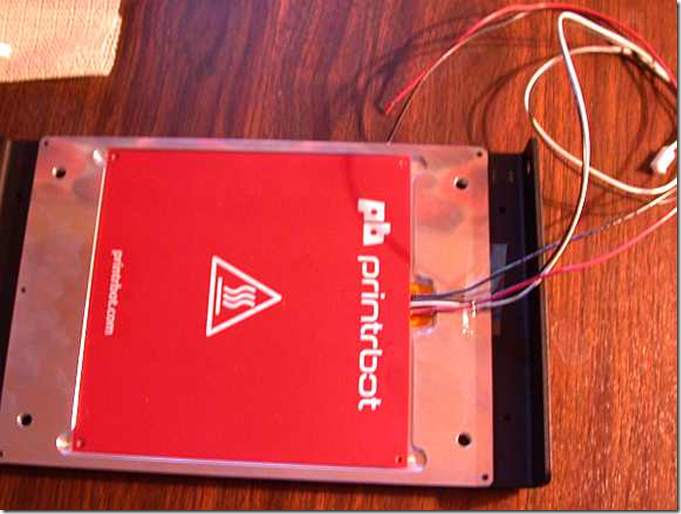 Instead of connecting the printer to the main computer, the Raspberry PI is committed as a wireless printer server, running OctoPrint . OctoPrint provides a web interface, so you can access the printer via any browser, anywhere. This is now the standard mode for how I operate the printer, it is very convenient. Also in the background is the new power supply serving the printer. The standard laptop-style power supply that came with the printer cannot be used with the heated bed, you need a power supply with more “grunt” as the heated bed draws about 7A at 12V. The power supply I use is rated at 10A and seems to be working fine for the job. 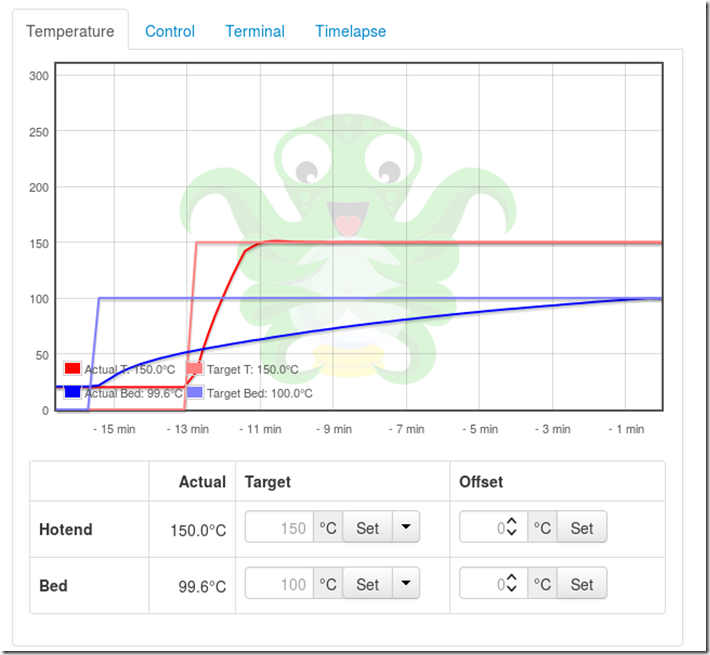 Below is how OctoPrint reports the temperatures of the bed and the hotend. The bed can reach 100C in about 14-15 minutes from a starting point of ~20C which I find adequate. 100C is required for ABS, but for PLA 60C is sufficient, it achieved in about 5 minutes. 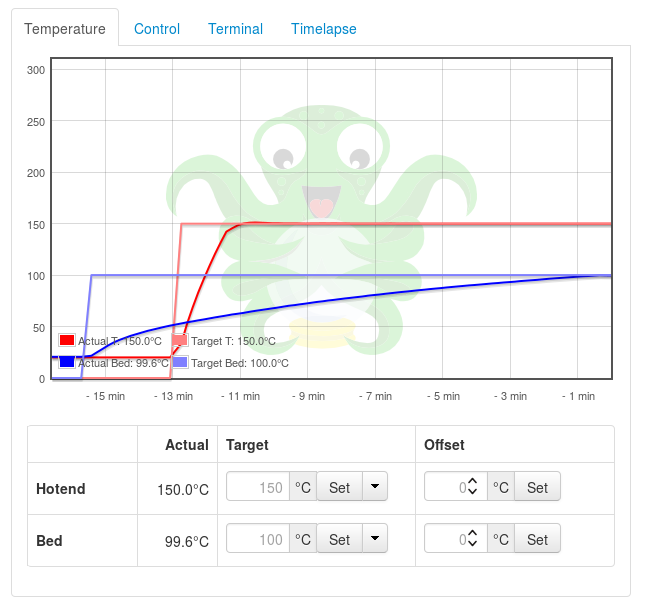 The temperature curves above are not really reflecting the standard heated bed upgrade shown above. It reflects an additional modification. I noticed that the black “wings” of the heated bed got quite warm, they acted as heat sinks and radiators, even with the delrin pieces in the kit that were supposed to insulate the “wings” from the machined print plate. It probably has some effect, but a lot of heat is lost that way still. The curve above shows the effect after installing the “blankets” described below. After completion, you get this nice looking view, four parts complete with holes for screws and belt tensioners. These parts simply “snap” onto the wings, the heat loss is now much reduced. I am very happy with these changes. The power supply is working, the Raspberry PI with OctoPrint is the perfect way to operate the printer, it works flawlessly even with the older Raspberry PI model B. It also frees up the main computer during long prints. The heated bed itself works fine, I can now print large parts without warping and I am also ready to consider printing ABS.